Caught in a downpour during lunchtime at Franklin and Arch Streets. I have been caught out like that, not without my shoes though. I love that Nike shoe running by itself!!! Happy BDay to Quincy's partner. First of all - HAPPY BIRTHDAY TO YOU! :) Many happy returns and thank you for entertaining us. Great shot! I love your photo! this is such a great photo! I was sent over here to look at it by Marie-Noyale. I have to come here more often. Lovely. van harte gefeliciteerd with your birthday! Happy Birthday!! This is an awesome photo!! Wonderful pic! Love the movement. I miss rain so much! So nice that she's smiling about the situation. A belated Happy Birthday to you! So glad you got a picture of this! 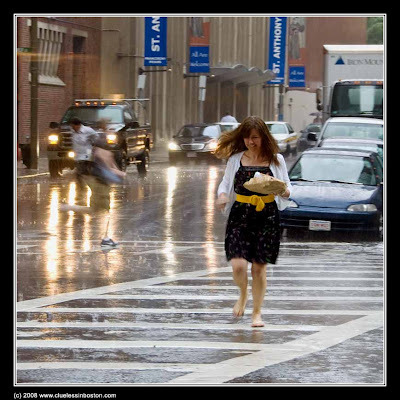 I was standing in the rain (a block away from here, actually) Wednesday waiting for it to blow over so I could go home and cracking up at all the women who were running down the street carrying their sandals in their hands...only my batter was dead so I couldn't take pictures! Excellent shot! You capture the right moment.